By the time this column appears, the full CBMS 2015 survey of math departments should be available at www.ams.org/profession/data/cbms-survey/cbms2015. I reported some of the data on faculty demographics in my October and November Launchings columns. This month I want to report on what is happening to undergraduate mathematics majors. From 2010 to 2015, the number of bachelor’s degrees in the mathematical sciences grew by just over 3,000, from 19,242 to 22,265, almost a 16% increase (Figure 1). However, most of the growth was in Actuarial Science (from 849 to 2354), Statistics (from 858 to 1509), joint majors (e.g. biomath, the total rising from 1222 to 1821), and “other” (including Operations Research, from 231 to 907). Degrees in Mathematics Education fell from 3,614 to 2,880. Traditional mathematics and applied mathematics degrees only rose by 326, from 12,468 to 12,794. Figure 1. Bachelor’s degrees awarded by departments of Mathematics or Statistics. For comparison, the total number of Bachelor’s degrees over the years 2010 to 2015 increased by 15%, and the number of degrees in STEM fields (specifically bioscience, computer science, engineering, mathematical sciences, or physical sciences) rose by 34%, from 238,000 to 319,000. The period 2010 to 2015 saw a decrease in the percentage of Bachelor’s degrees in Mathematics or Statistics earned by women, dropping from 42.4% to 40.8% (Figure 2). This does not include degrees in Mathematics Education awarded by Math departments. If we include them, then women earned 43.3% of the Bachelor’s degrees in 2015. Figure 2. 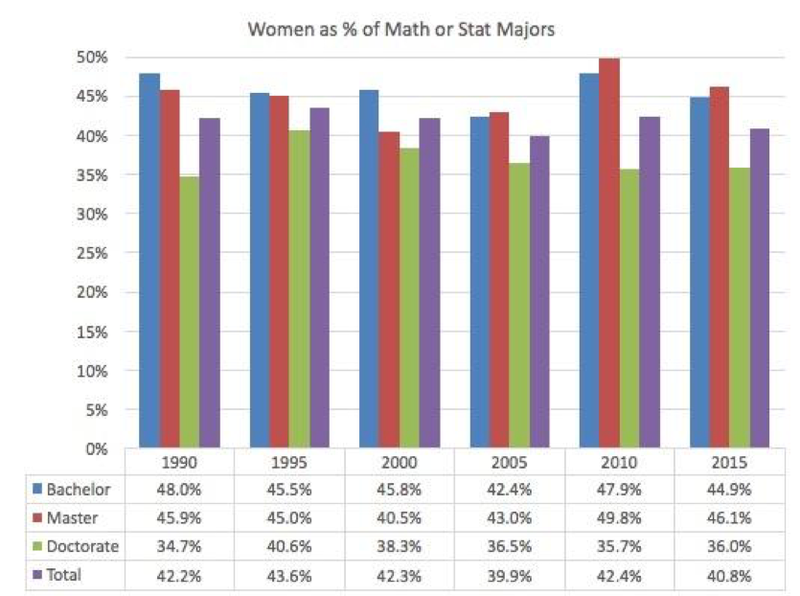 Women as % of Mathematics or Statistics Bachelor’s degrees, organized by highest degree offered by the mathematics department. Source: CBMS Surveys. Figure 3 shows the representation of African-Americans, Hispanic-American, Asian-Americans (including Pacific Islanders), and nonresident aliens. Here we are drawing on data from the National Center for Education Statistics (NCES), which is collected annually. Two trends are particularly interesting: the number of African-Americans has remained pretty much unchanged since the mid-1990s, and the number of nonresident aliens has exploded since 2007. It should be noted that NCES began allowing the designation “two or more races” in 2011. In 2011, 216 Mathematics or Statistics majors chose this designation, growing to 684 in 2016. These numbers are not reflected in Figure 3. Figure 3. Number of Mathematics or Statistics majors by race, ethnicity, or resident status. The following graphs, Figures 4–7, look closer at each of these four groups, comparing their percentage of all Bachelor’s degrees, of Bachelor’s degrees in Mathematics or Statistics, and of Bachelor’s degrees in Engineering. Again, these do not include students who designated as two or more races after 2010. We see that until 2000, African Americans were well represented among Mathematics majors in the sense that their representation was comparable to their representation among all undergraduates, but since then their percentage has noticeably dropped off. Hispanic Americans are underrepresented, but the trend is promising. Not surprisingly, Asian Americans are well represented among Mathematics and Engineering majors. 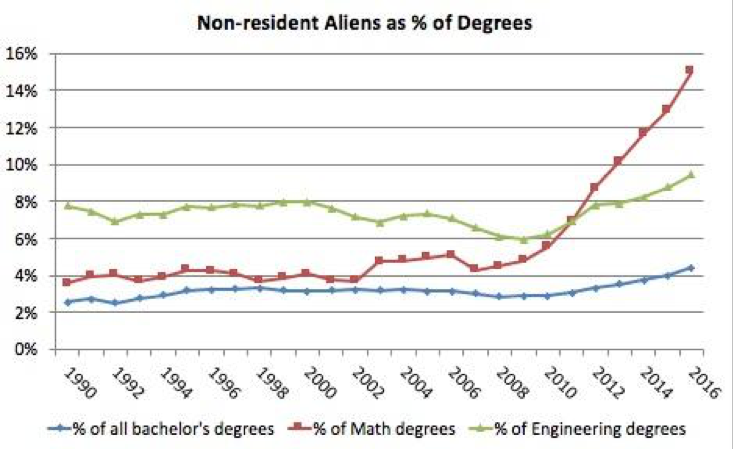 Non-resident aliens are growing as a percentage of all Bachelor’s degrees and all Engineering degrees, but their growth among Mathematics majors is remarkable. This attests to the importance of student visas in maintaining our mathematical workforce, but it also suggests that more could be done to attract U.S. citizens to the pursuit of Mathematics, especially African Americans. Figure 4. African Americans as percentage of all bachelor’s degrees and of bachelor’s degrees in Mathematics or Statistics and in Engineering. Source: NCES. Figure 5. 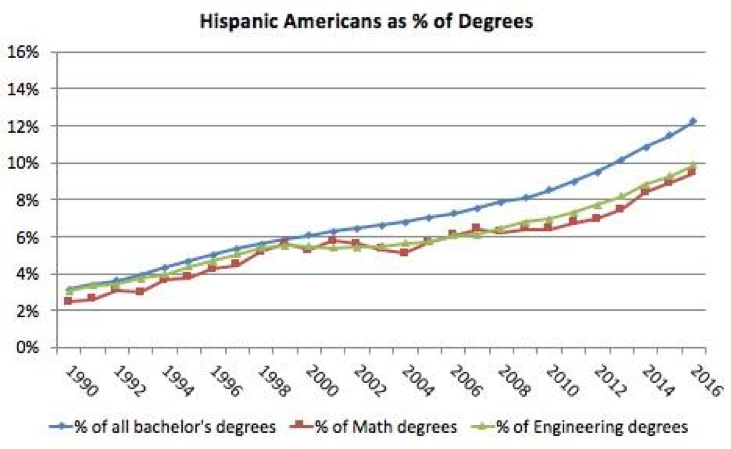 Hispanic Americans as percentage of all bachelor’s degrees and of bachelor’s degrees in Mathematics or Statistics and in Engineering. Source: NCES. Figure 6. Asian Americans and Pacific Islanders as percentage of all bachelor’s degrees and of bachelor’s degrees in Mathematics or Statistics and in Engineering. Source: NCES. Figure 7. Non-resident aliens as percentage of all bachelor’s degrees and of bachelor’s degrees in Mathematics or Statistics and in Engineering. Source: NCES.